The British are utterly deluded, said Michael Krätke in Der Freitag (Germany). They insist they won’t tolerate the free movement of labor from the EU into a post-Brexit U.K., yet they still demand access to the EU’s free market. The British are acting as if they have the upper hand and don’t have to concede a thing, when in reality they are the ones breaking the pact and must therefore bear the costs. It’s a cultural impasse: British elites have been taught to value “Oxbridge rhetorical skill,” so the U.K. negotiators “think they can talk their way out of any problem.” European elites, meanwhile, value competence and bureaucratic expertise, and want solid answers. 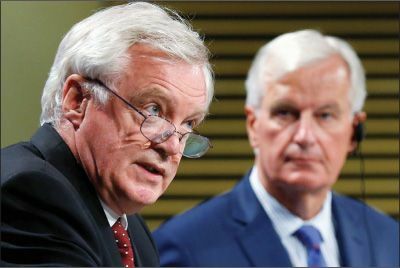 The intransigence is entirely the fault of that “Gallic popinjay,” the EU negotiator Barnier, said Andrew Pierce in the Daily Mail (U.K.). The vain, combative Frenchman has hated Britain ever since 2005, when he was French foreign minister and Britain strong-armed France into putting his beloved new EU constitution up to a popular vote, which it lost. He can’t hide his “visceral disdain for British values”—he sneers the term “Anglo-Saxon” as if it were a slur. It’s like negotiating with a toddler, said Janet Daley in The Telegraph (U.K.). The EU is demanding “an outrageous exit payment” of as much as 60 billion euros before it will even start trade talks. Yet faced with “a meticulous, point-by-point refutation” of the legal argument for such a payment, Barnier simply throws a tantrum.